Being a former English-lit undergrad and a voracious reader of novels, I never thought the day would come when it would take multiple months to get through a simple Oprah Book Club book (I may never get through Jonathan Franzen's Freedom!). But such is fatherhood. In fact, I just canceled my New Yorker subscription after a strong 16-year run. I'll still read what I can of that magazine online. But I've really discovered the perfect format for great stories for the free-time challenged: graphic novels. I bought a few recently. 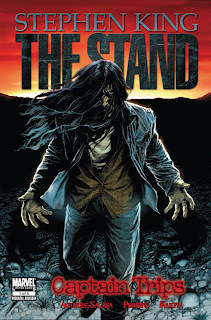 The first one I finished was one based on the first part of Stephen King's The Stand, which was probably the best novel I read before turning 16. The Stand: Captain Trips, from the famed Marvel company, tells the tale of several Americans who mysteriously survive a killer virus, popularly referred to as "Captain Trips." While everyone else dies, they try to make sense of what is happening. The premise provides perfect drama, and I just ordered the next parts of this series. Anyone half-way interested in a killer apocalypse tale should find this exquisitely drawn book. Better yet, read the 1,000-page-plus novel first, then read the comic (1,000 pages! That would take this proud papa half-a-year to get through).